All transactions are safe and secure with a reliable history in online purchasing behind each of our associates. 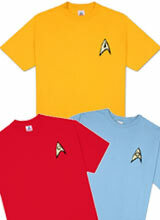 Buy the Star Trek Uniform t-shirts to own Star Trek clothing and merchandise. Gold (command and helm), red (engineering and security) or blue (science and medical), these Star Trek uniform t-shirts mean something to all fans. Regardless of which Star Trek movie, television series, or crew member is your favorite, this recognizable shirt is a classic addition to your clothing collection. Imitation is the sincerest form of flattery, so dress up as your favorite Star Trek character (or as all of them) any day of the week. If you aren't a Trekkie...yet... and are buying the perfect gift for a friend, just remember Captain Kirk wears gold, Spock wears blue and Scotty wears red. In addition to the Star Trek Uniform tees above, browse the Star Trek Clothing Gallery for more apparel like men's and women's clothes, kids shirts or hoodies.